For you convenience we accept VISA, MASTERCARD (Credit and Debit), AMERICAN EXPRESS, and DISCOVER Card, Certified Checks, Bank Draft and Money Orders. Soon we will be accepting Paypal for online orders. For all orders to be paid by Certified Checks, Bank Draft and Money Orders, Simply Complete this Printable/Offline Order Form and attach the appropriate Fundings. 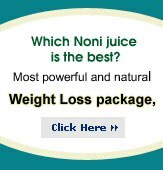 To avoid delay in processing of your order, please call us at 1-888-568-6029 or email info at Nonijuice dot us for correct total amount for your order before sending the payment. Prices at NoniJuice.us are only for United States customers though we ship worldwide. Please contact us for prices in other countries and we will be glad to help you. If you live outside of United States, your order will be shipped from a local warehouse in your country. We offer secure SSL connection while collecting shipping and billing information. We are continuously updating this web site with Updated information. Please visit us again.